This gastronomic tour aims to help you understand the various ways people of Madrid enjoy their city in terms of gastronomical experience. You will learn about raciones, pinchos, tapas and a great variety of specialties and delicacies that are often left undiscovered by the visitors from outside. 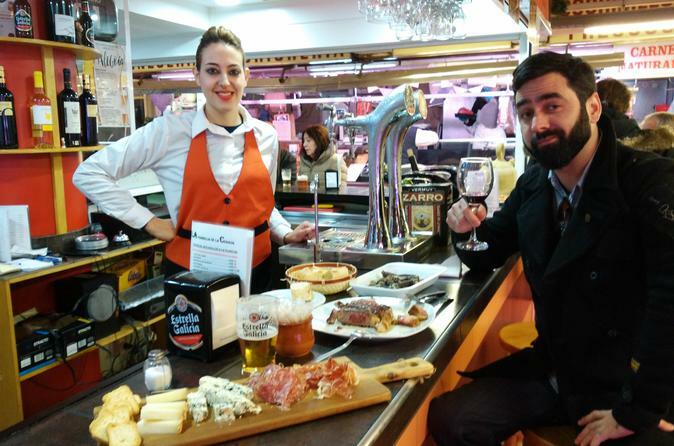 Hence, this is not a one of the many typical tapas tours, this tour offers a different concept and a more engaging way of exploring Madrid and its delicious ways. Discover Madrid on this 4-hour tour with a personalized itinerary, it means that it adapts to the travelers, which makes each of the tours a unique experience. The itinerary is flexible and will take you to the taverns without any previous arrangement, just the way the locals do, popping in and ordering what you feel like. The tour is lead by native local guide with deep knowledge of the city, its history and social life now and before. This is a group tour, but there will never be more than 6 people on this exploration - a perfect size to feel entertained but not overwhelmed. If you are in Spain, you have definitely heard about how good is the food. This is a must-do step to understanding Madrid from a gastronomical point of view!